Space Xmas Tour 2013 in Osaka, Tokyo and Nagoya!! 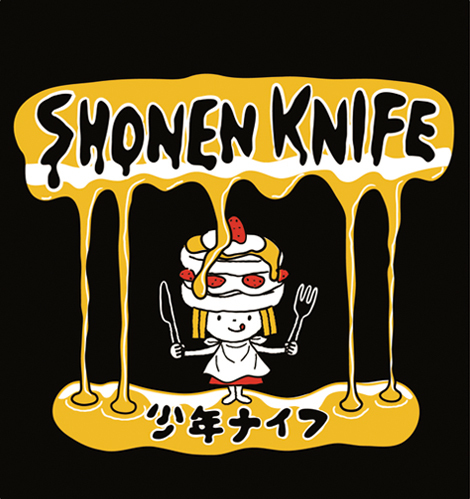 In this coming December, Shonen Knife , now on their tour in the UK/ EU, hit the annual live event, "Space Xmas Tour 2013" in Osaka, Tokyo, and Nagoya! They are planning to record their brand new album from October through December after the UK/ EU Tour! Some of their new songs could be introduced at the venue!! They perform fully on the stage with no other bands in this year's Space Xmas Tour. Rock and have a blast together!!! 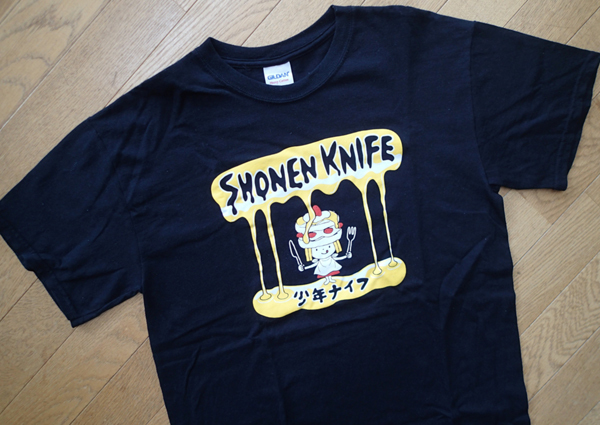 Brand New Shonen Knife T-shirts are arrived!!! We made new T-shirts and started to sell them from our U.K. shows in August. They are designed by Akiko Naito who is an illustrator living in "Edo-Shitamachi" the old style Tokyo area and brought up in Niigata. She works for various companies especially for Web. The character of the design is called "Pancake-chan". October 12th, Saturday Live at "Fandango", Osaka! honen Knife will play at an event "Fandango the 26th Shinkeisuijaku". It is the 26th anniversary event of the rock club "Fandango" Osaka. This show will be the first show after European tour 2013 for Shonen Knfie. Come and join the show!!! Uploaded the special trailer of "Soul Flower Train x Osaka Rock City"!!! 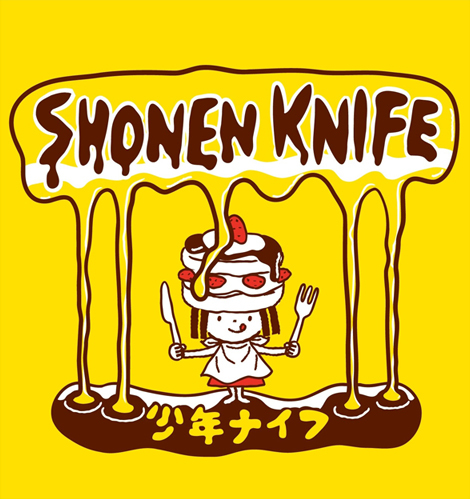 Shonen Knife made the theme song to YouTube. This trailer was edited by Hiroshi Nishio who is the director of this picture in person. Some scenes at "712 Day Party 2013" Osaka show at Shinsaibashi VARON on July 6th is used for the trailer. Motion picture "Soul Flower Train"
The cartoonist Robin Nishi x The movie director Hiroshi Nishio Two prodigies cinematized a great Manga "Soul Flower Train" which was written 17 years ago. The title song is "Osaka Rock City" from "Pop Tune" album by Shonen Knife. Will be showed at Shinjuku K's cinema from August 31st. 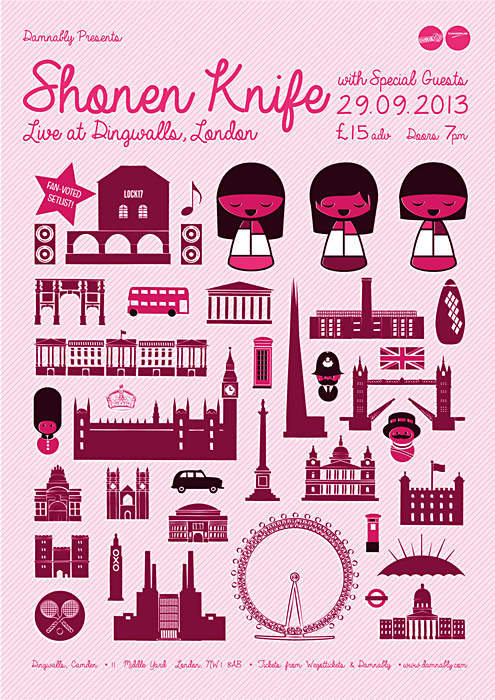 Fan Vote Set List show in London on September 25th!!! titled "SHONEN KNIFE FREAKS SHOW (FANS CHOOSE THE SET)". The set list on the day will be chosen by fan's vote. Ticket holders will get the address of the vote site and log in ID by e-mail. There is a repertoire list at the site and ticket holders can vote for a song which the band will play at the show. Get ticket and let's vote!!! August 17th Saturday BBQ Party show in London! 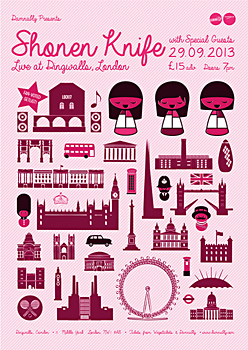 Shonen Knife will play at London Windmill on August 17th Saturday. It a special show as BBQ party. Shonen Knife’s UK label “damnably” held this show. Many bands from “damnably” label and Shonen Knife will play and serving BBQ. This show will be a very special one. Tickets are going out soon. slowgun, smallgang, Former Utopia, Passerines, Echolocation. 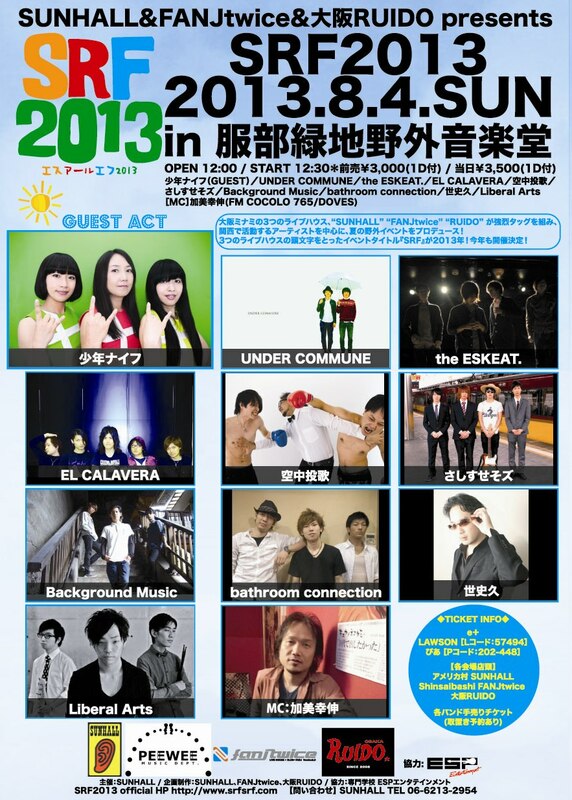 Will perform “SRF 2013” at Hattori-ryokuchi, Osaka! Shonen Knife will play at “SRF 2013”. It will be held at Hattori-ryokuci outdoor music hall in Osaka. This “SRF 2013” is an open air event which produced by 3 rock clubs in Osaka, “SUNHALLl”, “FANJtwice” and “RUIDO”.